The Modified Z-score applies the median calculation instead of the mean. Furthermore, the signed number of standard deviations is replaced by the Mean Absolute Deviation (around the Median). A standard Z-score reveals how far removed a data point is from the mean, measured in standard deviations. The modified Z-score applies the median whereas the standard deviations has been replaced by the Mean Absolute Deviation (around the Median). The modified Z-score is a normalized oscillator and can be used to identify extreme readings of the input series. The modified Z-score is calculated by dividing the absolute difference between a data point and the median by the Mean Absolute Deviation (around the Median). 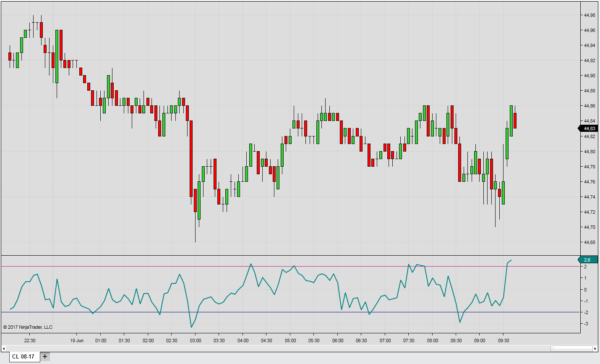 One of the main applications of the indicator is that it can be used to normalize any oscillator. For example, the MACD is a non normalized oscillator which does not pass the c-test intorudced by William Eckhardt. However, when the Z-score is used to normalize the MACD, the resulting oscillator uses a normalized scale and will pass the c-test. The normalized MACD is obtained, when the MACD is used as the input series for the modified Z-score.